My nephew Emerson didn't get out of the hospital until Friday. He had an infection where his feeding tube was put in after Christmas. Later we learned that part of it fell off inside him. The worst part of the whole situation was that the surgeon didn't want to see him when my sister called him initially. The doctor said, "He'll be fine." Shaking my head - what? When my sister messaged me at work about this I messaged back telling her that it had to be an infection, and to call our Pediatrician Doctor Harrison (my kids go there as well). Doctor Harrison saw Emerson within an hour, he called the Surgeon's office, "Yes! You are seeing him! He has an infection!" By that time it had spread, was really red, the redness was hot, he had a temp, a high white blood cell count, and Emerson was not a happy camper. The Surgeon proceeded to tell the Pediatrician that he didn't need to be seen. Anyhow Doctor Harrison won that fight. The Surgeon got some not so nice comments from my sister at the hospital. Emerson had antibiotics, slept a lot, his infected area drained a lot. Once he could have surgery to take his feeding port out to put in a new one they did. He is doing better, but still tires out easily. 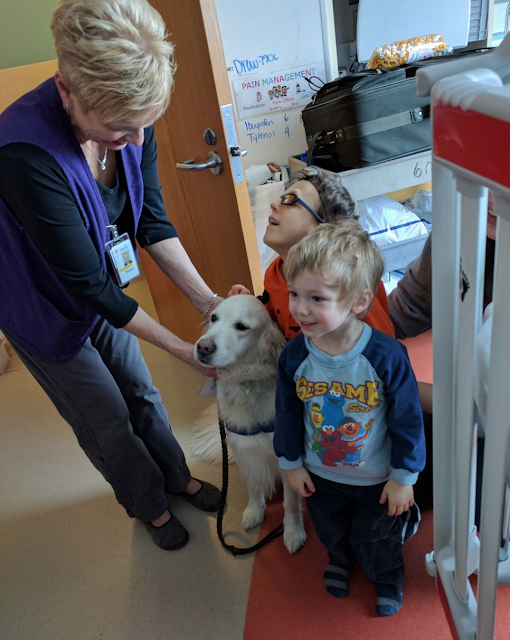 The hospital's therapy dog came by right as Emerson was about to leave. I guess it sounded like Emerson said, "All Done!" when they got in the car. He does say a few words, but not consistently. By the time they started to ride up their hill he was clapping. Emerson was smiling a lot because Edison and he kept hugging. Have you ever had a hospital stay? What did you have to go in for? I think my boys have had more medical care than I ever have when they were babies. I'd have some choice words for that surgeon too, then I'd also take those complaints to the head of the hospital. I have to drive 2 and 1/2 hours to Chicago when I need procedures done for my illness and I gladly do it because every single staff at the University of Chicago Medicine takes your concerns very seriously. Emerson deserves to have the best care and if that surgeon isn't doing his job, he needs to be replaced pronto! I agree with Theresa. If he's that flippant with one patient, he's likely that way with others. I'd report it too. Glad he's feeling better!